As we had no need to be granted pass through the sekisho, we looked over and left the town of packed buildings on both sides of the river-bank behind us in the slightly crisp but fresh autumn air of Kiso valley. 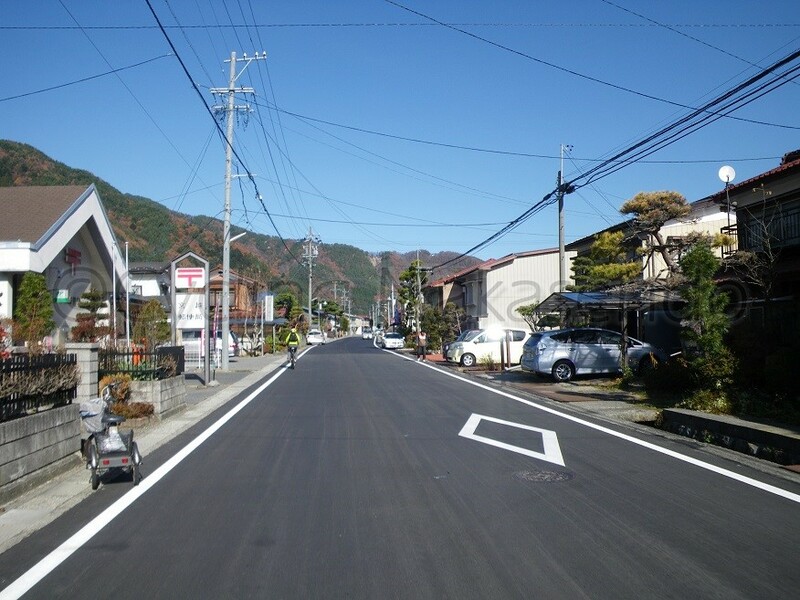 There is a massive recently constructed steel “sekisho” gate on the way out from the town of Kiso-fukushima, then Nakasendo splits into roads heading left and right after the intersection connects with Route 19. 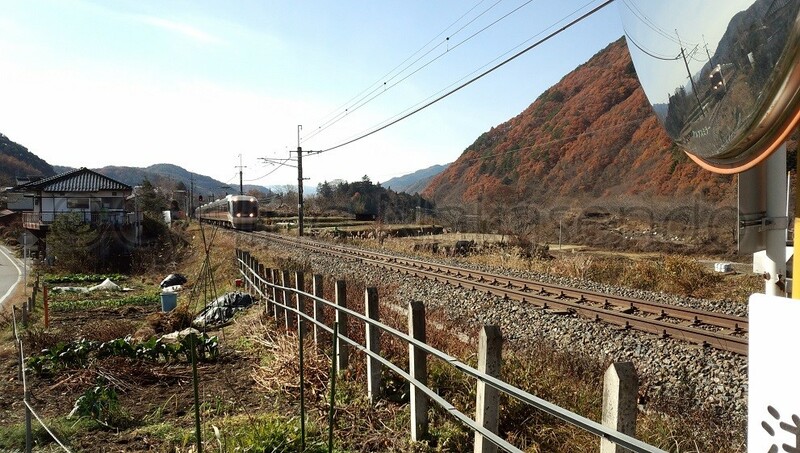 It goes along the Kiso River for several hundred meters and then merges back with Route 19 again. We went along the river for as long as we could in order to avoid the busy Route 19. At some points we were inevitably pushed out onto Route 19 but a wide and smooth side walk has been provided so, apart from the dirty exhaust fumes, it was not so disturbing. It was good to know that we didn’t contribute further to this while we traveled on our bikes. The sheer beauty of natural surroundings in this area, the scenery of snow covered summits and running crystal-clear water of Kiso River seemed to purify the soul. We crossed over the Chuo Main Line track via a back street and rode further through what were typical old settlements accompanied with shrines along the trade route. We continued along short uphill and downhill stretches to cross small streams then we turned back onto Route 19 at Kurimoto intersection. At this point the original trail led into a bush followed by a rusty steel-mesh-floor-bridge built over a river. Within 300 m on Route 19 we turned left to get back onto Nakasendo. It was quite a nice ride on a relatively flat road through quiet scenery of farmhouses and rice fields situated on a gentle slope in the valley. Shortly before reaching the settlement of Harano, we came across a sign that indicated we were right at the middle point between Kyoto and Edo on the Nakasendo. Behind the sign was beautiful Mt. Kiso-komagatake which had snow on its summit. Before going further I checked the alignment of the front brake pads and disc on the mountain bike because I kept hearing a noise that indicated that either side of the front brake pad was constantly lightly touching the disc while we were riding the 6.8 km from Kiso-fukushima. It turned out that my suspicions were correct so I tried to fix that problem. This is why I do not like rinko (disassembling bikes and packing them for train transport) with bikes equipped with disc brakes because one frequently has the problem of having to take the wheels off and on many times. 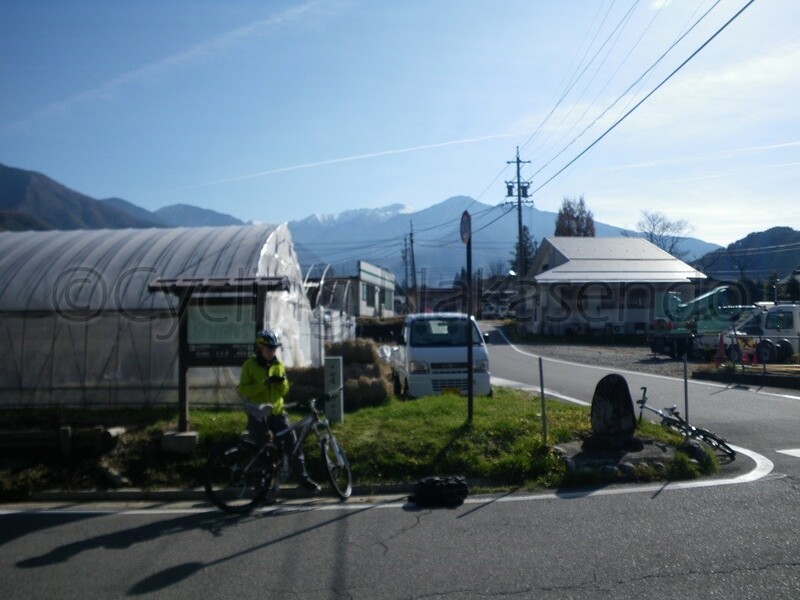 We started off again as I finished adjusting the clearance of the brake pads and passed through Harano which is now a small residential settlement where the existing old style houses along the road are in keeping with the atmosphere of the old trade route. A railway crossing came up just out of Harano settlement and we waited there until the Limited Express Shinano for Nagano passed. If we had used this train instead of riding, it would have taken less than an hour to complete our planned itinerary for the day. However, I feel that time allowing, it would be a great waste not to experience the landscape surrounding the time worn highway, Nakasendo. We could see a concrete factory on the left, after we crossed the railway track and the density of buildings increased as we approached the post town of Miyanokoshi. Miyanokoshi was formerly the base of the regional warlord, Yoshinaka Kiso and his mistress, Tomoe, in the 12th century. The post town was also burnt in 1883 and now most of the houses are pretty new. The road is wide where there used to be a waterway in the center. I started to think about where we could get some energy supplies other than drinks as I was getting slightly hungry. I saw some general stores and a post office in the town center but none of them were opened because it was Sunday. We turned left at Miyanokoshi Station to cross a bridge to Yoshinaka-kan (history museum of Yoshinaka) then turned right at the corner in front of Yoshinaka’s family temple, Tokuonji, which was established in 1168. The road goes flat through rice fields and Tokuonji settlement. From there I was able to see traces of the original Nakasendo vanishing into the mountains before crossing a bridge over the emerald green Tomoe-buchi, a natural pool formed in the river where legend has it Tomoe used to bathe. The road took us back onto the present day Route 19, along the beautiful upstream section of Kiso River and past ancient forest. As we got on a narrow sidewalk to avoid the scary beasts of steel on Route 19, the uphill climb continued for 530 m to the intersection that connects with Route 361. There are traffic lights at the intersection and I hoped to go along the disused former road of Route 19 along the riverside as I did several years ago. Unfortunately it had become dilapidated and unsafe with fallen rocks and crevasses in the road-bed. The original Nakasendo runs much higher along the mountain ridge. One is struck by the fact that even roads made with new technology are no match for the resilience of nature and need constant maintenance. With this in mind, maintaining Nakasendo must have been an extremely challenging feat especially in sections of the highway such as this. We went straight into Yamabuki tunnel which has a decent sidewalk but like most tunnels it was filled with disgusting exhaust fumes, so we tried not to breathe in there. We followed Route 19 until we came across the intersection at the entrance of another tunnel where we could take a pleasant detour along the river. For 850 metres along this route the road was just wide enough for one car, offering a reprieve from the noisy traffic of Route 19. 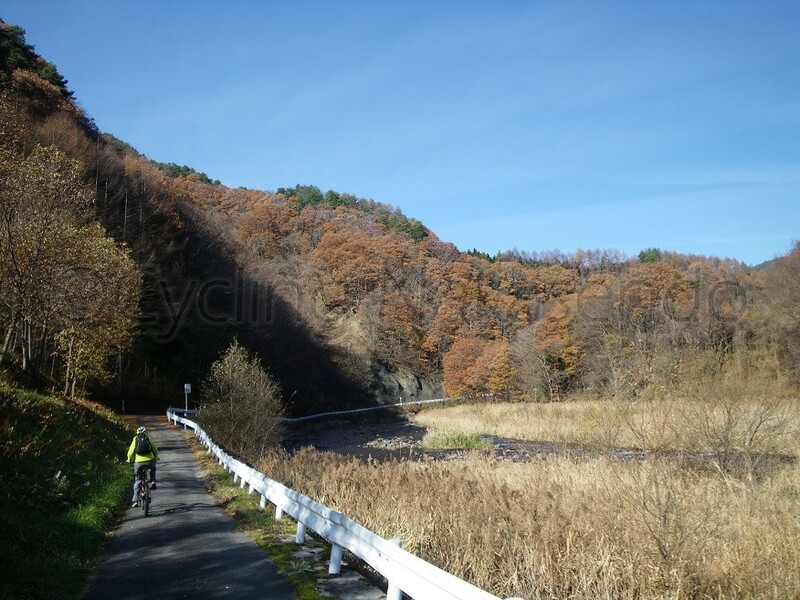 Going via this route did add extra distance to our journey but the payoff was being able to ride through beautiful natural surrounds with Kiso River to the right and autumn trees on the left. This path ended upon rejoining the modern road of Route 19 which inclined gently for 1.4km until reaching the intersection of Yabuhara. If one heads left from here Yabuhara Station becomes visible. The original Nakasendo is accessible via taking the underpass in front of the station and crossing to the other side of the road passing Yabuhara Station, but as it was already 12 noon we decided to go straight to the station for a toilet stop and a rest. We took the opportunity to refuel. I ate a jelly-like energy supplement, and NC had the remainder of the Kurikinton okoge. Although the day’s ride was easier compared to the previous day, as we had covered 18 km and climbed 195 m our bodies had not had enough time to recuperate, not to mention our behinds which were a constant source of pain. NC seemed to really like the Kurikinton okoge, which she finished in the blink of an eye. Admittedly there is something about the sophisticated flavor of Kurikinton and mashed roasted chestnuts combined with that of the slightly crunchy texture of the ‘street food’ okoge, that is hard to stop eating. While it was good enough to sell the fact that it was a gift seemed to make it even more delicious. After we had eaten and had a rest I discussed the next part of the route with NC. 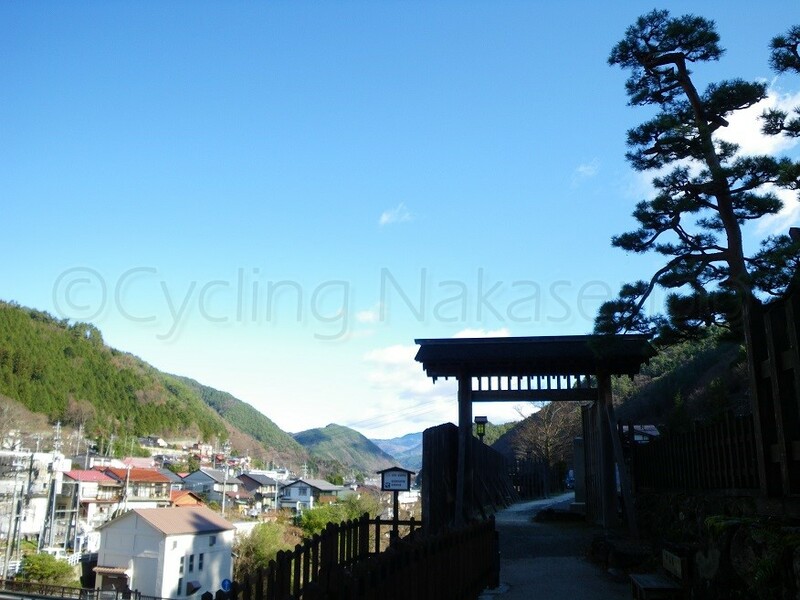 To ride from where we were in Yabuhara to Narai post town along the original Nakasendo involved climbing a steep incline to an altitude of 1197 m to pass over Torii Toge (mountain pass), about 260 m difference in altitude from where we were. The other option was to ride through the Torii tunnel, which was likely to be heavy with traffic. NC expressed that she would prefer to avoid the exhaust fumes and danger of the busy traffic in the tunnel. And with that it was decided we would climb the mountain. After leaving Yabuhara we would enter the mountains so it occurred to me that it would be wise to get my bear bell out of my backpack. I then realized, crap, I had forgotten to pack it.